The Renewable Communities program, part of the Central Victoria Solar City project, was delivered in the communities of Newstead, Murchison and Kyabram, through a partnership between SRA and volunteer community leadership groups. 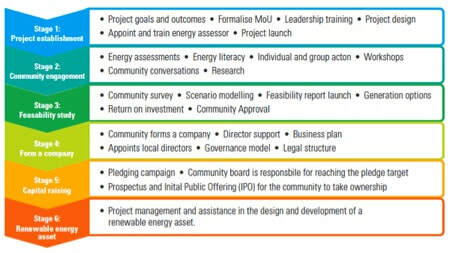 The 100% Renewable Communities model was delivered in six incremental stages, with communities choosing how many stages they wish to achieve and over a certain timeframe. The model is structured to be flexible to achieve community goals and outcomes. How it WorksSRA employed a home energy assessor and engagement officer in each town and supported the completion of a pre-feasibility study into potential renewable energy generation options within or close by to the town. The community leadership group developed a plan to engage their community in the program. The engagement generally started with one or two town meetings to explore the purpose and vision for the project. The community then embarked on a goal to engage households and businesses in increasing their energy literacy before focusing attention on the development of a renewable energy asset. Whilst there are currently no opportunities for new communities to participate in this program, those interested in pursuing energy efficiency and local renewable energy generation goals at a whole of community level can click here to access current resources available, including insight into what a social survey and pre-feasibility study looks like. Renewable Newstead: January 2011 onwardsThe town of Newstead has just over 200 households. 175 residents and 9 businesses completed an energy assessment, and other energy efficiency and renewable energy products and services were also taken up. Renewable Newstead also received a pre-feasibility report that identified possible options that the community might pursue in their goal of becoming ‘100% Renewable’. The local leadership group is now working with ABB, a global leader in the development of power stations on the design phase of a renewable energy generator. ABB became aware of the project following a presentation at the Australian Solar Conference and sent a team to Newstead to explore opportunities to work with the town to design the technical solution for energy generation. The leadership group continue to work on the business for co-investment from the community and government to develop the local energy company, including the generation asset. Renewable Kyabram: May 2012 onwardsRenewable Kyabram has pursued a whole of community engagement approach, focusing on the engagement of key community leaders and groups, such as council, business, schools and farmers, establishing support and building trust through partnership development, home and business energy assessments, workshops, community presentations, and the development of an iconic renewable energy demonstration project. One partnership example is the collaboration between Murray Dairy and Renewable Kyabram, ‘Renewable Milk’, where local dairy farmers and service providers met to make sense of the solar industry for dairy farmers. The workshop provided preliminary economic modelling for two 2 dairy farms where owners would maximise generation to match consumption to offset electricity costs. Renewable Murchison: May 2012 onwardsRenewable Murchison focussed on the delivery of energy assessments to engage and promote energy efficiency in town, with 140 completed. In an effort to gauge community sentiment around the development of a local renewable energy asset, 76 social surveys into energy use, energy behaviour and renewable energy were also completed. The summation of these community opinions complemented Murchison’s Preliminary Feasibility Report into potential local renewable energy asset options.